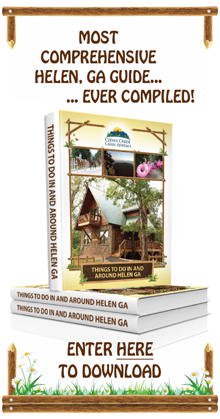 Some vacationers visit Helen, Georgia and the surrounding area for peace and quiet, and some come for outdoor thrills. For those who are a bit adventurous, nothing will quite match the excitement and fun of whitewater rafting. To make sure you know everything about north Georgia rafting, we’ve provided the why, where, how, and what, all right here. Why go whitewater rafting in Helen, Georgia? If you’re not sure why you’d want to do it at all, whitewater rafting combines the joys of nature, adrenaline, and new experiences all into one. Gorgeous views, sudden drops, and active participation in the rowing all make for a unique outing that can’t be imitated. But if you’re already looking to take a rafting trip and are wondering why north Georgia is a solid destination, the answer is about creating the best possible schedule and setting. Whitewater rafting trips are often a great reason to set up a weekend event rather than a quick out-and-back trip. Many of the best rivers for these excursions are tucked away in natural settings that require a little driving, so rather than rushing the experience, it helps to find accommodations in the area. Fortunately, the north Georgia mountains have numerous inns and cabins for visitors who might arrive on a Friday, raft on Saturday, and head home on Sunday. Such a plan is typical for small and large groups alike. In fact, many of our own guests find that contrasting the peaceful north Georgia forests and towns with the rushing river rapids adds more excitement than treating your rafting trip like a routine stop in your schedule. Once you’ve committed to a rafting trip, you’ll want to choose a rafting company. Several fantastic rivers run through Helen, Georgia and the surrounding areas. Each has its own features, although some rafting companies only provide trips on certain rivers. Movie buffs will find this river very familiar. 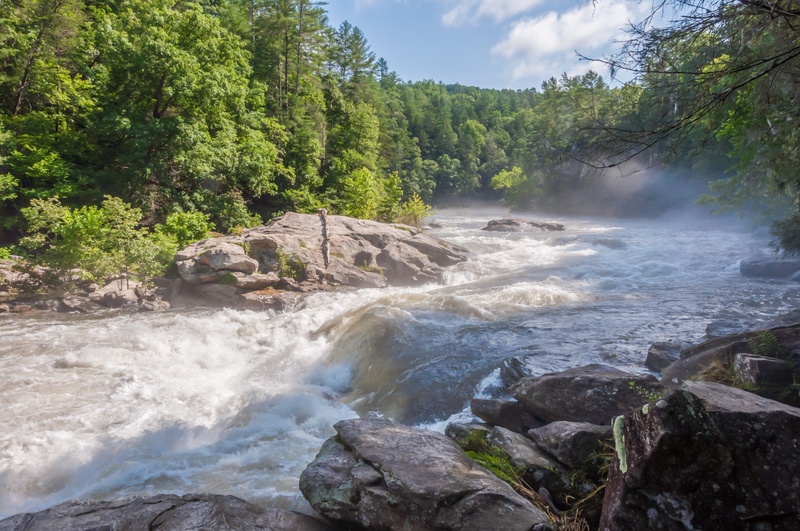 Featured in the Burt Reynolds and John Voight film, "Deliverance," the Chattooga was designated a Wild and Scenic River only two years after filming had finished. Don't let the depressing and sometimes frightening nature of the movie dissuade you from rafting this gorgeous river. Be aware, however, that one accurate portrayal featured in the film is that rafting in a number of sections of this particular river should only be attempted by seasoned rafters. While there are some areas suitable for children and families, many portions, such as an area known as "five falls" reach a class V intensity. Long before Alan Jackson put the Chattahoochee on the proverbial map, local residents have greatly enjoyed rafting down this river that cuts through the town of Helen. For the majority of the time, the water is relatively calm, which makes it a relaxing experience for the entire family. In the rare event that water spills over from the dam that empties into the river (making it a class III), an alarm will sound, providing more than ample time to return to shore. Also close to Helen, this river is quite calm, perfect for rafting beginners, families and children. Most of the course is full of slow and easy waters, never getting above a class II. Plus, no matter where you begin, the Soque will meet up with the Chattahoochee River. Perfect for a relaxing, fun time with North Georgia rafting. This river runs the gamut of classes. It is divided into two sections suitable for rafting: one that runs from Old Highway 441 to Tallulah Falls and another that goes from Tallulah Gorge to Lake Tugaloo. The former features mostly classes II and III rapids, while the latter is full of classes IV and V. However, if you can brave these rapids, the sights surrounding this area are nothing short of breathtaking. This short rafting trip, typically around forty minutes, seems to be tailor-made for the intermediate rafter. The class III rapids provide the perfect opportunity for a less experienced person as they work their way up to the more difficult, and dangerous, classes. And like the Tallulah River, Tiger Creek presents a number of opportunities to enjoy the sights of the beautiful landscape. Whether you decide to brave the monstrous rapids or partake in a more leisurely whitewater rafting adventure, you'll find that rafting in the North Georgia Mountains has something for everyone. So grab your raft and your gear, and begin a world of adventure.